Living Space: 7800 sq. ft. This beautiful 4 Bedroom, 4.5 Bathroom Home sits on an acre of landscaped property. There is also a 2 Bedroom guest house and a 2000 sq ft garage and workshop. 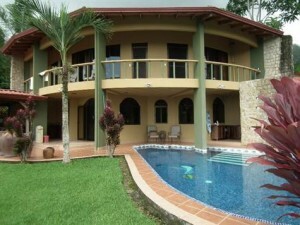 In front of the house is a beautiful pool, covered dining areas, and a bbq rancho! The entire property is well thought out from the gated entry to the paved parking areas. The property has nice ocean and jungle views. The home has an original rounded shape to it with rap around balconies. It also has a large laundry room and an office. It is located in Ojochal. The access is good and you are minutes from great restaurants, grocery stores, and bakeries. The nearest beaches are Playa Tortuga and Playa Ventanas!! The home is being sold fully furnished so it is ready to be moved into. This home would make a great rental. The sellers are very motivated and ready to listen to offers!! Owner Financing Is Available With 50% down!!! !